The bright sky envisioned in May has proven true in 2018, with even a mild GDP growth acceleration to 3.1% from 3.0% in 2017. It is a synchronised growth pattern across the regions as well. The eurozone continues on a robust growth track as the US accelerates on the back of fiscal stimulus. Emerging economies are continuing steadily with a few notable exceptions. 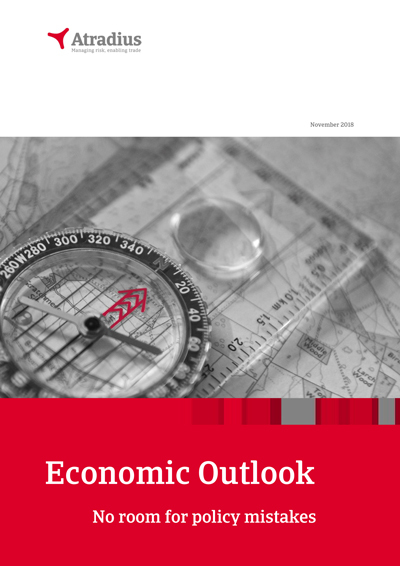 Next year global GDP growth is expected to moderate. This is not really a surprise: the business cycle peaks, US fiscal stimulus fades, the Fed continues monetary tightening and China’s economic growth continues to slow. It is increasingly appropriate that we included the ‘for now’ qualification to our ‘bright sky’ outlook. Clouds are quickly gathering on the horizon, emanating primarily from policy mistakes.